A visual representation of an entirely plausible conspiracy. Don´t look back now, they may notice you know about them. It is better to keep them unaware of your awareness. Anyway conspiracies do not exist, they are the illusion induced by eating too much coconut cake. Unless it's the coconut cake conspiracy. In that case, RUN LIKE HELL! Any conspiracy theories you may come across while in this delusional state are only there to hide the real truth that the molemen from deep below my bed are running the show. For more on conspiracies, tune to KOOK, that's 1337 on your AM dial! Or try and decipher the secret codes in the static! Hours of fun for the kids! New Scientist magazine back in July had a fascinating article by psychologist Dr Patrick Leman called "The Lure of the Conspiracy Theory" - about the psychology behind belief in conspiracy theories, which seems to be increasing in modern society, and indeed has become something of a cultural phenomenon. The Net is partly to blame: "One factor fuelling the general growth of conspiracy beliefs is likely to be that the internet allows new theories to be quickly created, and endlessly debated by a wider audience than ever." The article makes the point that there are good and bad things about conspiracy theories. The good: sometimes conspiracy theories are true (e.g. 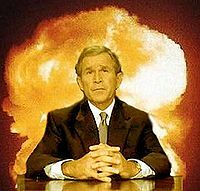 the Iran-Contra affair), and conspiracy theorists can be the little guys keeping big corporations or government in check. The bad: they can spread (misplaced) mistrust and fear, which can get in the way of reality and what is actually true and important. Research has been conducted, by Dr Leman and others, into what makes people believe, who tend to be believers, and why. Age, ethnicity, income are apparently all factors. The possible link: those who feel generally disaffected, disempowered in society, are more likely to believe in conspiracy theories. "Flashbulb memory" - the recall of a sudden event, often shocking and global, which affects individuals on a personal level. Apparently this type of memory is more easily formed between 20 and 35 years of age, which is why different events tend to trigger flashbulb memories for different generations - the John F Kennedy assassination, Princess Diana's death, etc. "Major event - major cause" - people often believe an event with major consequences is likely to have been caused by something major. Because if the cause was minor (e.g. a single drunk driver) then it seems like there's been no real cause and effect, life feels more unpredictable and uncertain, which makes us uncomfortable. Easier to assume the cause was something big. "Confirmation bias" - people generally tend to pay more attention to info that is consistent with their existing beliefs, and absorb that kind of info more readily. This applies to both conspiracy theorists and anti-theorists equally (and, in my view, many so-called "scientists" too) - rather than objectively consider all the evidence, both look for "facts" which fit in with their existing theories and dismiss or discount evidence to the contrary, or change their theory to tie into the new info! Research in fact shows that different people can claim to use the same bit of evidence to support entirely different theories. Finally, based on his findings, he produced a presumably tongue in cheek how-to on producing a perfect conspiracy theory. I can foresee some unscrupulous people cynically exploiting this to make up and spread conspiracy theories of their choice - but then they'd probably work all this out for themselves anyway, it actually seems pretty much common sense to me. If I want to deliberately build a conspiracy theory for maximum dissemination and then make a fortune writing a book about it, well now I certainly know how to start! Pick your bad guy - government, big corporations etc. Ideally also pick on some shadowy, cult-like organisation which can supposedly be connected with your adversary. (I know The Da Vinci Code is fictional but, heh, Opus Dei was a good pick!). If you lack of imagination, the jews are always a pretty good choice, however it's very trivial. Pick a major current event to base your theory on - especially an unexpected, shocking, visual event that's shared. Develop your story - pick & choose your source info, construct a compelling story from it, and hey if something doesn't fit your story, reinterpret it! Sow uncertainty, query the official evidence, find new facts contradicting it. Prepare your defence - be prepared to tweak your conspiracy theory around the edges should anyone point out any inconsistencies etc, but always hold to the core theory, emphasising that it's just a question of getting the evidence to prove its truth. And if others question your theory, well they must be in on the conspiracy too, mustn't they? We would like to make it clear to all Uncyclopedians that there is no such thing as The Uncyclopedia Conspiracy. Please stop spreading rumors. All rumor-spreaders' accounts, IP addresses, names, and social security numbers, and all other information deemed necessary for correction will be turned over to UC Cognitive Corrections department A-101. 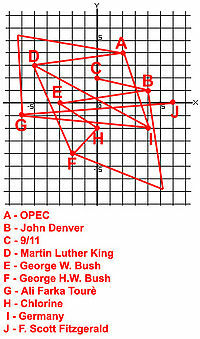 Conspiracy theory - An example of a written work by a conspiracy theorist. ...Nevermind, You will not believe it. This page was last edited on 10 March 2012, at 00:44.